Diane: Lithodora diffusa Grace Ward Short 6" - Plant 15" apart. Zone 6-10. Spreading dark green mat is engulfed in true blue flowers from March to July. Excellent as an edger or in the rock garden. Must have full sun, and not too much water., cut it back after flowering to freshen the foliage. Peonies grow best in cool climates, because they will only bloom well if they experience a pronounced period of winter chilling. Peonies grow and flower best in full sun, but will tolerate some light afternoon shade. Peony plants are not overly fussy as to the soil, but they will definately benefit from the addition of organic material and compost into the planting hole when they are set into the garden. Other than that, they need good drainage and a soil pH that is close to neutral (pH 7.0) or at the most, only slightly acidic. Peonies should be planted away from large trees or shrubs because they will have compete for root space and nutrients, resulting in the size and the quantity of the flowers being reduced. Peony plants do not respond well to transplanting, so choose your planting location carefully. The best time to plant peonies is in early fall. (early September until mid October are ideal) so they will have time to become established in the soil before winter. Mature plants will reach a diameter of three feet or more and so it is important to give them enough room to grow and develop. The planting hole should be at least 18 inches deep and about 18 inches in diameter. At the bottom of the hole, add a 4 inch layer of organic matter such as compost, pine bark, or well-aged manure. A half cup of a good plant food (10-6-4), bone meal or superphosphate should be mixed into this layer. You should avoid adding fertilizer to the soil that will be in direct contact with the roots. Fill the hole half way with a mix of garden soil and compost, and then set the root division in place with the eyes facing upward. Spread the roots outward and evenly. Make certain that the eyes will be no deeper than two inches when the planting is completed, or your Peony may fail to bloom. If potted peonies are being planted, plant them at same level as they are growing in the pot. After the division or plant is in place, work the soil in around the roots, finish filling the hole, and then water again. If root divisions are planted in the spring, they may not bloom for up to two years. 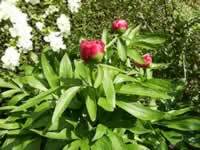 However, Peonies which are potted and already growing may bloom for you the first year when planted early enough in the spring. Peonies should be fed in early spring and again halfway through the growing season. Cultivate a half cup of low nitrogen fertilizer (5-10-10) into the soil when new growth about 2 or 3 inches high. Use care not to damage the roots, and try to keep the fertilizer from direct contact with them. Over-fertilizing, especially with a high nitrogen plant food, results in weak stems and reduced flowering. Peonies are particularly partial to potash, and will benefit from the incorporation of a couple cups of fireplace ash into the soil in early spring. During the dry summer months, Peonies require regular, deep watering. A spring application of 2-4 inches of leafy, organic mulch will help to conserve the soil moisture and at the same time keep the soil cool and control weeds. This mulch must be removed and destroyed before winter and a new, fresh winter mulch of loose straw or evergreen boughs added, to help control disease. Larger Peony flowers will be produced if the side buds on each stem are removed as soon as they are visible. The terminal bud on each stem tip is left intact. Remove the flowers as soon as they fade to prevent seed development, which will use up needed food reserves, and effect next years bloom. Peonies should only be transplanted or divided when it becomes absolutely necessary. An established and productive plant may not need dividing for ten to fifteen years or longer. Carefully dig around and under the plant to avoid cutting off roots and remove the clump from the hole. Remove all of the old foliage, and hose the dirt from the root cluster. Carefully cut or pull apart the roots into sections, making sure there at least 3 or 4 growth eyes in each new section. Trim away any soft or damaged spots with a sharp, clean knife. Dust the cut surfaces with a fungicide to discourage disease infection and rot. Replant into a newly prepared area of the garden. It is not a good idea to plant them in the same place where they were previously growing.